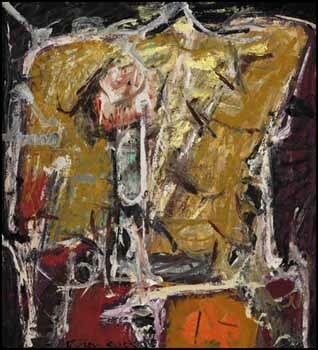 Robert Fulford wrote that Harold Town’s paintings from the period 1955 to 1965 straddled the two separate forms of abstract painting that were current at the time: “action painting”, represented by Jackson Pollock and his Canadian contemporary Jean-Paul Riopelle, and “layout painting”, as most famously represented by Mark Rothko and, in Canada, Jack Bush. We can relate Fulford’s theory to this Painters Eleven period painting. Although the drips and swirls of Riopelle or Pollock are absent, this work contains a frenzy of energized and dynamic brush-strokes such as those found in “action painting”. Yet the formal structure created by the application of dark bands of colour creates a predetermined design similar to that of a “layout” painting. Town’s bridging of these two forms of abstraction created a painterly style that was distinct and fresh, which generated significant success for him in the years to follow. Ultimately, this work features the strengths that Town was highly regarded for: contrasting intensities of colour, edgy yet organized composition and, of course, his palpable enthusiasm for abstraction.